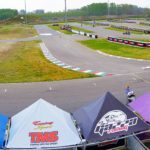 Ottobiano, Pavia (Italy) 13 April 2019 – Under partly cloudy but dry weather conditions, the first round of the 2019 S2 Supermoto European Championship season has started today in Ottobiano in the region of Pavia, Italy. The Ottobiano Motorsport park is one of best well equipped venues in Europe for Supermoto races. With fast straights, tight corners and a challenging off-road section there is plenty of action for the spectators and riders. TM Factory Racing rider Thomas Chareyre started the new season with pole-position for the race tomorrow. On Saturday morning 23 riders started the first free practice in Ottobiano. Most riders did already some tests before the event of joined the free practices yesterday, so straight from the start of the session all riders had a good rhythm. After some warmup laps the tyres were warm enough to set faster and faster laptimes. 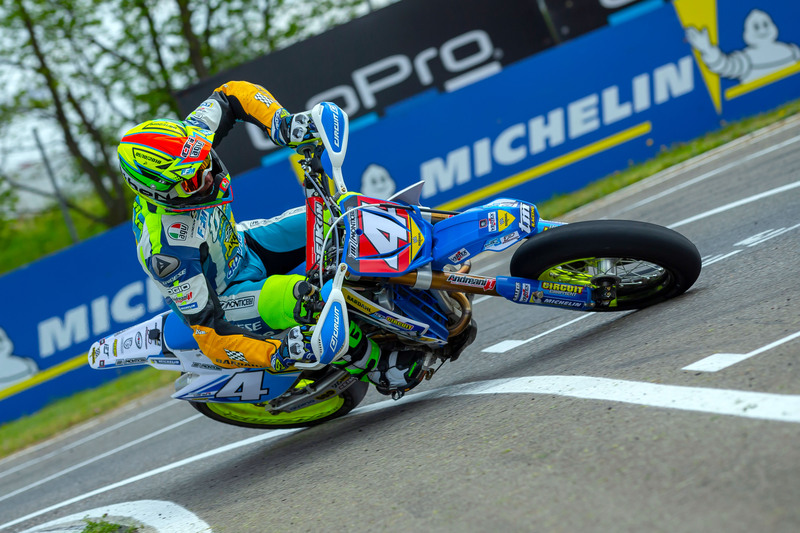 In the beginning of the practice it was TM Factory Racing rider Thomas Chareyre who was setting the fastest times, but the others were not far behind the multi champion form France. Phoenix Racing rider Marcus Class was not far behind together with TMS Tuning Motorsport rider Milan Sitniansky and the teammate from Class at Phoenix, Nicolas Cousin. After 10 minutes in the session the laptimes went from 1:32 to 1:30 minutes and the riders were pushing harder and harder. In his ninth lap Thomas Chareyre managed to set a time of 1:29:960. With this time Thomas Chareyre was the only rider who set a time under the 1:30 minute mark. Markus Class and Milan Sitnianksy gave all they could but had to settle for second and third place in this practice 00:491 seconds behind the fastest man. 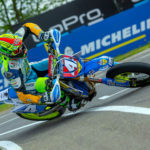 Nicolas Cousin did a good solid practice session and took the fourth time in the end, 00:114 seconds in front of Degasoline rider Pavel Kejmar who completed the top five. The second free practice start at 13:30 hours in the afternoon. Again all riders entered the circuit straight from the beginning. Every rider wanted the maximum of track time to be ready for the time practice later in the day. Already soon in the session the lap times got faster and faster. Together with their mechanics, the riders managed to set up their bikes perfectly. In this session it was Phoenix Racing rider Markus Class who set the fastest laps straight from the start and soon the German rider was setting times of 1:29. Not far behind it was Degasoline rider Pavel Kejmar who also found a fast pace. Thomas Chareyre did some slower laps but in lap six the Frenchman pushed his TM to first place with a laptime of 1:29:155 which was half a second faster than in the morning session. This was the sign for Markus Class to push even harder but the German rider had again to settle for second place, but only 00:096 slower than Chareyre. Third place in the second free practice went to Milan Sitniansky who sets his fastest time in the last lap of the session. 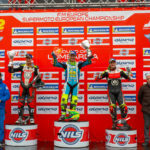 The fourth time was set by Pavel Kejmar in front of the teammate of Class, Elia Sammartin. With five riders under 1:29, the the time practice will be full of tension and action as all rider want to be on the first start row for the races tomorrow. Last session of the day for the S2 Supermoto European Championship riders was the time practice. In the time practice the places on the startgrid for Sunday are divided so all riders went on the track as soon as the light turned green. With 30 minutes to go in cloudy but perfect dry weather conditions the riders tried to get as much speed out of their bikes as they could. After a few slower laps TM Factory Racing rider Thomas Chareyre opened the throttle of his TM and set a laptime of 1:28:807, but the French rider knew he wasn’t safe as Phoenix Racing rider Markus Class was for far behind on his Husqvarna followed by Elia Sammartin and TMS Motorsport rider Milan Sitniansky who showed good speed in all sessions. After a last modification to his bike, Thomas Chareyre went on track again and in his tenth lap he sets the fastest lap time of the day in Ottobiano. 1:28:724 was the time to beat for the rest of the riders. In the same lap Markus Class was also very fast but the German rider missed the pole-position on 00:075 seconds. The third place and last place on the front row will be taken by Milan Sitniansky. The Round of Lombardia will be broadcasted delayed, by clicking HERE you will obtain the full tv list.